Windows 7 now calls small networks homegroups — they used to be called workgroups in Windows Vista and Windows XP. If you want to share files over a mixed homegroup and workgroup network, you need to know how to get the different systems to recognize each other. Homegroups and workgroups can coexist rather peacefully on the same network. However, when you try to access the Public folder of the Windows 7 computer from one of the workgroup computers, you’ll usually receive a security screen. 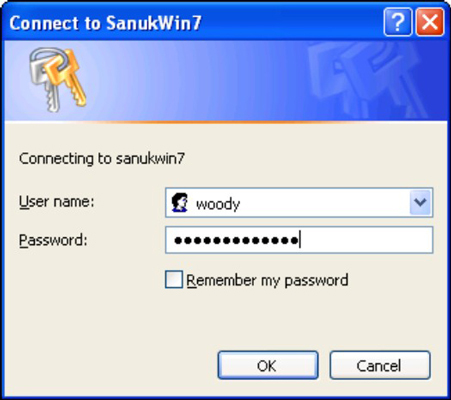 To get past the security screen, you need to know the username and password for each account on the Windows 7 computer before you can get into its Public folders. However, you can avoid this security screen if you set up an administrator account on both the Windows XP (or Vista) computer and the Windows 7 computer, both with the same username and password. When you do this, Windows 7 passes you through without a challenge. Using this trick allows you to avoid the hassle of security, but it does leave you open to other hazards. In the worst case, a bad program that runs on one computer may be smart enough to reach out to other computers on the network and infect them: the Conficker worm, which spread in early 2009, took advantage of that exact weakness.